An intriguing speculation on William Clark’s involvement in a plot to separate Kentucky from the fledgling United States. 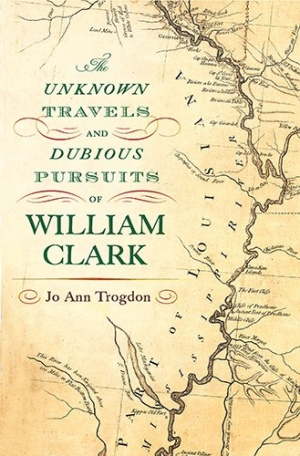 In The Unknown Travels and Dubious Pursuits of William Clark, author Jo Ann Trogdon explores Clark’s early years, before he achieved fame as half of the Lewis and Clark Expedition. She makes a case to support the theory that perhaps Clark was, for a time, a traitorous mercenary, or at the very least, caught up in the questionable exploits of those who were involved in the plot, known as the Spanish Conspiracy, to separate Kentucky from the United States. The book focuses on the tumultuous 1790s, when America was in its infancy. The British were in Canada, and the Spanish were in Florida and Louisiana, when Clark left Kentucky in 1798 headed for New Orleans. Traveling by flatboat on the Mississippi River, he brought with him a cargo of tobacco and furs ostensibly to sell when he arrived. Trogdon wonders if his real mission was to record important information regarding military outposts, as well as the twists and turns of the river, which he would later share with spies who supported Spain. Working from Clark’s journal and ledger entries, Trogdon illuminates this fascinating time and its cast of characters who possessed varying degrees of corruptness and wasted little time on lofty ideals. Their chief concerns seem to be padding their wallets, gaining power, and acquiring real estate. Although there’s no conclusive answer as to Clark’s culpability, Trogdon raises important questions that give us a fuller understanding of a man who helped shape our nation. Trogdon’s meticulous research includes a biographical appendix that goes a long way toward clarifying who’s who since there’s a long cast of characters, and several had the surname Clark. There’s also a section about Clark’s journal and how it came to be found, a transcription of Clark’s diary entries, a bibliography, and more. All of this combines to make this a completist’s dream come true, and a serious reference for any scholar of American history.